Following-up after Monday's piece on Allyship Post Trump, we're moving from talking about allyship to sharing concrete steps and actions to show up, support, and perform allyship. And since today is Thanksgiving, I'd like to pay homage to the Indigenous people resisting a destructive pipeline in North Dakota that is threatening ancient burial grounds, clean water, and our shared environment. Ah, Thanksgiving. An always-ironic holiday, and incredibly more so with Black Friday--a day when people are trampled, harmed, and sometimes killed by others who are rushing to take advantage of "deals" for things (that should have originally had that price tag but hey #capitalism) despite spending the day before being thankful of the privileges that they already have--coming a day later. And now, with violence escalating at Standing Rock as Indigenous people of this land (whose genocide marks the day's festivities) continue to resist militarized occupation, the whole thing is infinitely more ironic. And disgusting. So, naming that and moving forward, I hope to use this space on JooJoo Azad today to share a few ways Indigenous people are asking for support: today, tomorrow, and the day after. 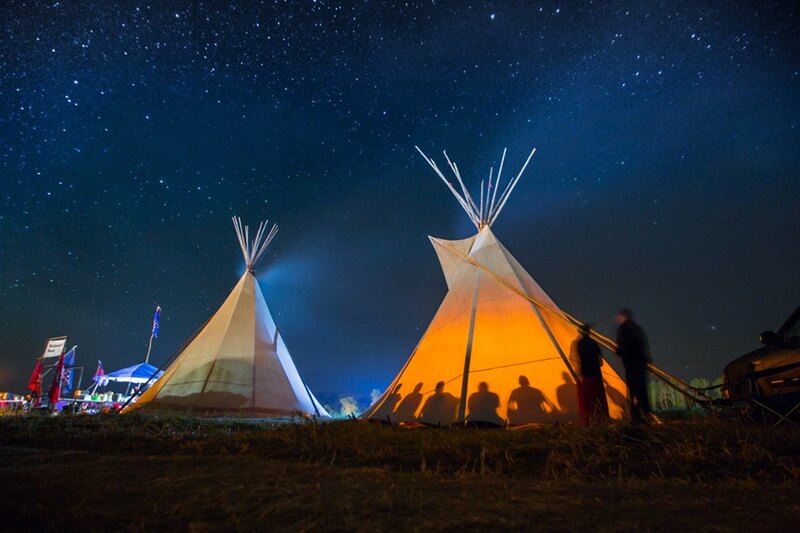 Photo c/o the mind-blowingly talented Indigenous photographer Tomas Amaya -- be sure to peep more of his photography from Standing Rock. + Kelly Hayes runs a blog called Transformative Spaces and writes, shares, and documents extensively on her and her friends' experiences and observations at Standing Rock. She has traveled to Standing Rock several times herself, and when she's back in Chicago she frequently shares live-streams on her Twitter account during attacks or moments of high tension. + Yes Magazine has an entire section on Native Leadership that, aside from its breathtaking photography, covers everything from action items to provocative analysis to debunking myths that you might have peeped your facebook newsfeeds, too. 2. Donate | I initially was planning on sharing the GoFundMe page for Sacred Stone Camp, but friends who have been active on-the-ground at Standing Rock advised me to link the Medical Council instead, as Sacred Stone Camp has been largely taken over by non-Indigenous people who are not sharing the funds with others there. Monetary donation is incredibly important, despite not always feeling so. Note that on this list I didn't add "physically go to Standing Rock" -- if you are able to fund a trip to North Dakota, perhaps instead consider using that money to support the work of the medics (that is so urgently needed, especially as violence has only been escalating against them) and those already on-the-ground who have sacred investment in this work. Rather than adding additional bodies that need guidance and instruction, fund work that's already happening. Or fund an indigenous person to go instead. "The holiday shopping season is crucial for the economy because around 30% of annual retail sales occur between Black Friday and Christmas. For some retailers, such as jewelers, it's even higher -- nearly 40%"
Mind-blowing numbers aside, it's important to note that people & institutions who don't care for human life usually at least care for the economy (i.e. their own businesses) (only). So, if using a militarized police force to respond to peaceful protesters isn't valuable in and of itself to draw attention to a major crisis, then it only makes sense to turn to what will. 4. 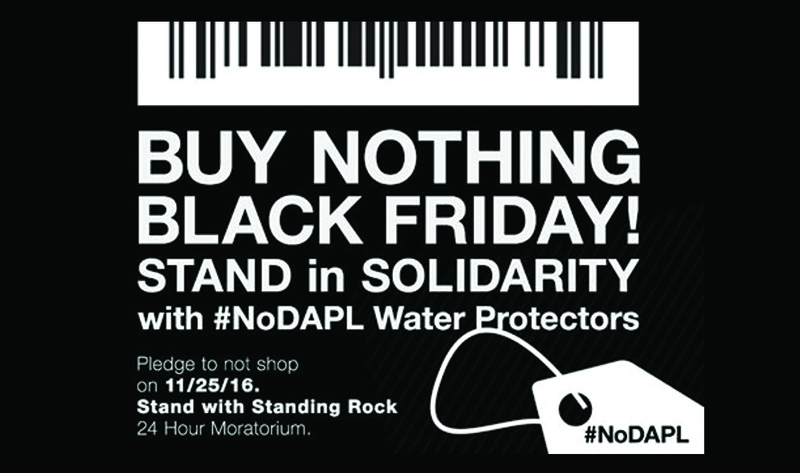 Or, shop tomorrow | Well, for the sake of the boycott, this doesn't necessarily need to happen *tomorrow,* but if you are going to be spending your money this week, put your money towards supporting beautiful Indigenous-designed brands--especially those who are also actively supporting #NoDAPL. (This is a political fashion blog of sorts, after all). One of these rad Indigenous-designed clothing brand is NTVS Clothing, whose t-shirt design was the cover image for this post. Because they're that good. They have a whole dope t-shirt line dedicated to Standing Rock, and donate proceeds of their profits to the camp as well. Also, they came out with a freaking Indigenous emoji pack. Another of my personal favorites is OXDX Clothing -- and because we're linking to them here on JooJoo Azad you know they're also ethically produced! My favorite piece is the Jagged Steps Leggings from their 2016 Fall Collection, "Save What We Have Left." Their work is political, unapologetic, and inspired by their roots (and resistance). 5. Call. Agitate. 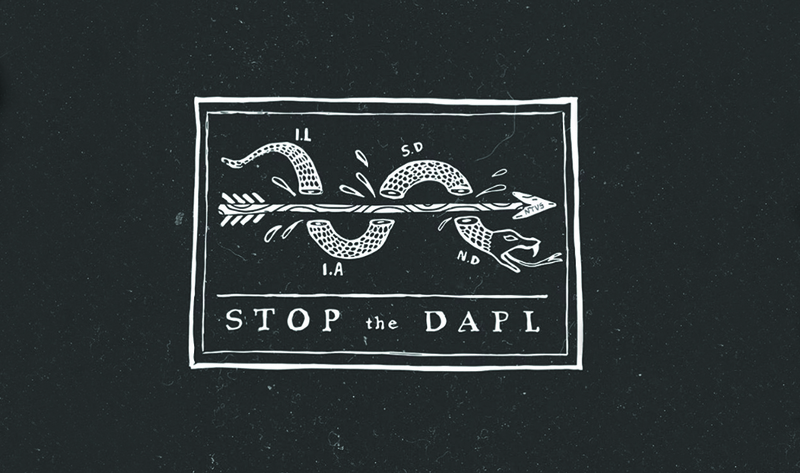 | The governor of North Dakota is Jack Dalrymple. i.e. the man who is sending militarized police to unarmed and peaceful protesters. His number is 701.328.2200. Call him. Leave him a voicemail. Do it again. Send it to your friends. *my lawyer has advised me to redact that statement. (but his address is still there, wink wink hint hint). Think Obama is a light of hope? Prove it. Call him. The White House's number is 202-456-111 or 202-456-1414. Tell him to rescind the North Dakota Access Pipeline, which is incredibly harmful to the environment beyond just Standing Rock. 6. Talk. (Especially with your fam) | (if you are able to). Again, it might not be physically, mentally, or emotionally safe for you to confront your racist aunts and uncles, so without shaming those who are unable to, please understand how important it is to be bringing up politics over Thanksgiving. Your family will listen to you before they listen to others. Your family will reason with you before giving my words a chance. And this is especially pertinent for my white friends--family members who have never experienced a politically uncomfortable conversation, understood the complexities of white supremacy and how they benefit from it at the expense of people of color, or have already started normalizing (or hell, even voted for) trump, please. talk. to. them. Talk to them about the Water Protectors at North Dakota. Show them the hyper-militarization (snipers. internationally-banned chemical weapons. armored trucks. water canons in freezing temperatures) Tell them that the foundation of this country was built on the genocide of Indigenous people and on the backs of Black (many of whom were Muslim) slaves. Tell them what they can do about it. + Call for winter interns + volunteers!